With Auto-Delivery you'll never run out of your favourite products! SAVE AN EXTRA 5% on all of your Auto-Delivery orders! FREE: costs nothing to join and there are no extra fees! SAVE TIME: you won't have to keep re-ordering your favourite supplements! LOWEST PRICES: you are guaranteed the lowest current price! MANAGEMENT: update delivery frequency, pause, resume or cancel anytime! 1. How often would you like to have this item dispatched to you? 2. How many of this item should be in each dispatch? 3. The first dispatch of this item will be sent once you place this order. Newton-Everett Nutraceuticals has formulated the highest potency joint support product on the market today. Research strength levels of the top three joint support nutrients, Glucosamine, Chondroitin, and MSM, have been combined for total joint health. Try it and discover why millions of people rely on these nutrients for joint support. How Long Should I Take Glucosamine/Chondroitin/MSM? Studies show that long-term usage of Glucosamine/Chondroitin/MSM is most beneficial. Most patients see benefits within three to six months of regular usage. Suggested Use: Take 2 tablets daily with a meal. Take for 4-6 weeks to see results. Warning: Consult a physician before using if pregant, nursing or on medication. Store in a cool, dry place away from children. Do onot purchase if seal is broken. Do not exceed the stated daily intake. Thanks, you've already rated this review. There was an error with your request. it is very good product. Never before was so good for my artrosis in my hands. Yets I dont remember pains. Told by my GP, years ago, that glucosamine helped 1 in 5 people and recommended by him that I take a high dose I selected super flex -3. Several weeks later I found I no longer had 'downhill syndrome' on my long walks with the my rambling group and could shed my knee bandages. Wonderful! I am now 77, still rambling without pain and still taking super flex-3. Best value I can find for this GLUCOSAMINE & CHONDROITIN combination especially the periodic offers. Also taking just 2 tablets a day is more convenient. Superflex 3 was recommended by a friend and I have used it for years. I have tried to do without it but have found my joints become more stiff and painful again when I do - so I don't!! 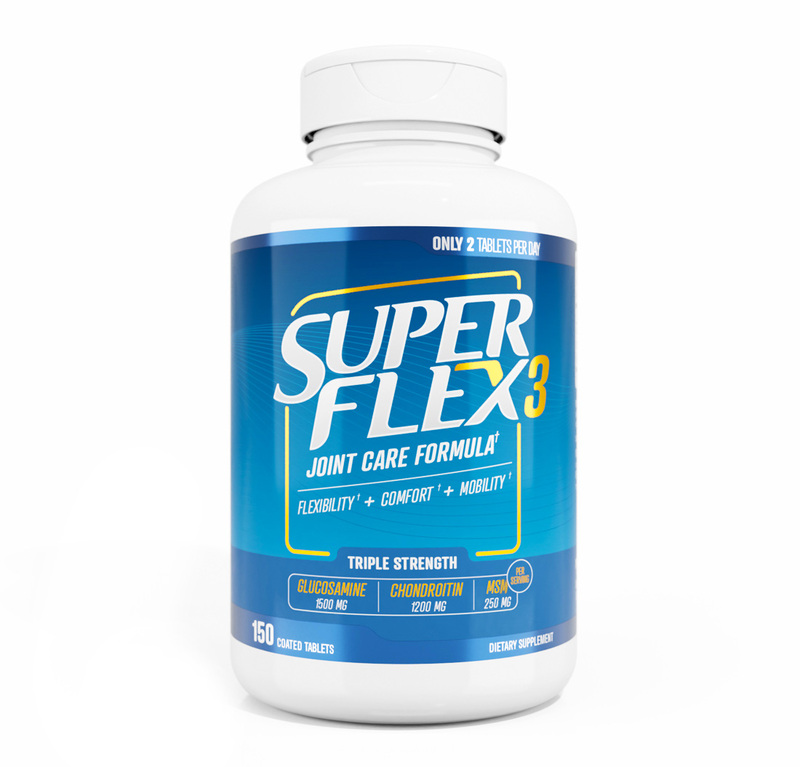 Since taking Superflex 3 both I and wife have noticed a marked improvement joint pain. In particular knees as we are walkers. Since the original review we have maintained the improvement and each take two tablets a day with one cod liver oil capsule.I continue to take Superflex 3 though I have had a cartilage repair following a fall. My consultant, who is prominent in knee sports injuries is a fan of chondroitin. I was advised by my specialist to take glucosamine and chondroitin tablets in 2006 to help with my knee pain until surgery took place.I have been taking 2 tablets per day ever since and, unbelievably, surgery has not yet been necessary.X-rays of both my knees show that I have severe osteoarthritis in all 3 compartments but I remain almost pain free. These tablets are working wonders for me. Great product!! I have been in the 'iron game' for over 25 years and have been using this on and off for a good few of those years. I say 'on and off' because when I take the stuff my knees are fine, so I don't buy any more. Saving money and popping fewer pills, right? A few months pass and the joints start causing me grief again. So my reckoning is that I should go back to what worked for me last time, and within a few days I am pain free once again. And here I am writing a review about this product! I'm the biggest skeptic I know, but this stuff really does do what it says it will. If you are happy with the review click Publish review. To make changes, click Edit.